The Benkelman Beam Apparatus is generally used for pavement analysis. 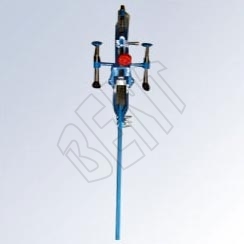 The principle of our Benkelman Beam Apparatus is that a long beam is laid on a road surface at one end and balanced at a point to provide it a ratio of 2:1 that will magnify small refractions triggered by loadings adjacent to the end of the beam in connection with the road. With this, the small movement can be measured precisely by utilizing a highly stable platform adjacent to the other end of the beam. Light weight construction that can be separated into two parts for ease of transport. Supplied with dial gauge 0.01 x 25mm. Compact, unique and possesses a telescopic design.